Death in a Wine Dark Sea by Lisa King, a Mysterious Review. Review: Journalist Jean Applequist is attending an evening reception following the wedding of her friend from college, Diane, aboard the yacht of the groom, Martin, when she suddenly hears a call for help. Spying Martin in the choppy waters of San Francisco Bay, she throws him a life preserver then runs for help. By the time the boat's captain and some of the other guests return to the point where he presumably fell overboard, he can no longer be seen. "They'll never find him in this weather. It's the proverbial wine dark sea," Jean says. And after three hours, he's presumed dead. Jean takes the new widow home only to receive a phone call from Martin himself, saying he survived and will be back at the house soon. But he never makes it; his body is pulled from the water just a couple of hours later, dressed in his wedding tuxedo. The police initially think the call from Martin to Jean was a prank of some sort, but can't come up with a reason for it. Jean, however, is convinced that someone tried to kill Martin on his yacht. That suspect list is fairly short, and limited to the guests on board. But if he lived long enough to make it to shore, where he was killed by someone else, that list of suspects is fairly long indeed. 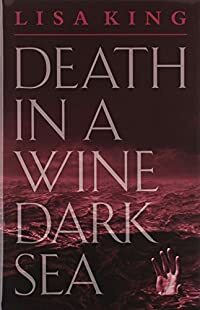 Death in a Wine Dark Sea is the first mystery in this series by Lisa King, and introduces an unusual, though engaging, lead character. Jean Applequist is more pragmatic than idealistic, seeing events for what they are as opposed to what she — or anyone else — wants them to be. She also doesn't try to (unrealistically) do everything herself; she has a wide circle of friends and taps their individual strengths at appropriate times. The only minor fault with the book is its relatively thin murder mystery plotline. It's twist-y and turn-y, to be sure, but sometimes it seems that the whole point of these narrative gyrations is not so much misdirection but simply to give the character something to do. The author wisely crafts the story, however, so that the suspect list is expanded after it is known that Martin survived the initial fall overboard, giving Jean a larger cast to consider, rather than simply investigating the short list of characters attending the wedding reception. The most interesting unknown element is whether there were one or two people involved in trying to — and later succeeding in — killing Martin … and if two, were they working together or was the second simply taking advantage of the failure of the first. Acknowledgment: Permanent Press provided an ARC of Death in a Wine Dark Sea for this review.